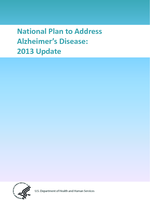 This is the PDF version of the 2013 Update of the National Plan to Address Alzheimer's Disease. There have been updates yearly since this report was originally published in 2012. A complete list of the National Plan and updates, and their direct URLs, is available on the second page.